While researchers have examined many antecedents of marketing strategy, there is scant research assessing the effect of organizational cognition. 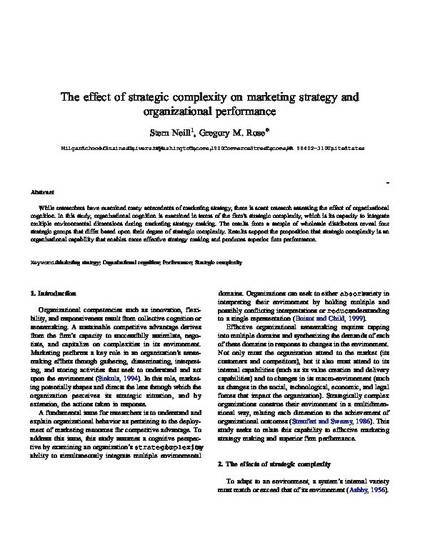 In this study, organizational cognition is examined in terms of the firm’s strategic complexity, which is its capacity to integrate multiple environmental dimensions during marketing strategy making. The results from a sample of wholesale distributors reveal four strategic groups that differ based upon their degree of strategic complexity. Results support the proposition that strategic complexity is an organizational capability that enables more effective strategy making and produces superior firm performance.